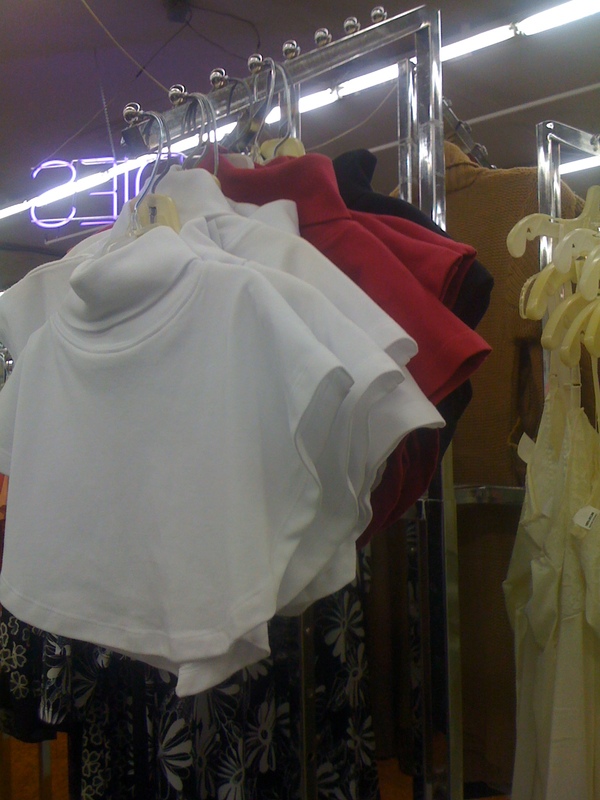 Ever walk into a store and feel as though you have stepped into a time warp? As though, the entire building the people inside and the contents of the store could be from any decade in the past fifty years? If you want to experience such a phenomenon I suggest you go visit Stan’s Merry Mart. 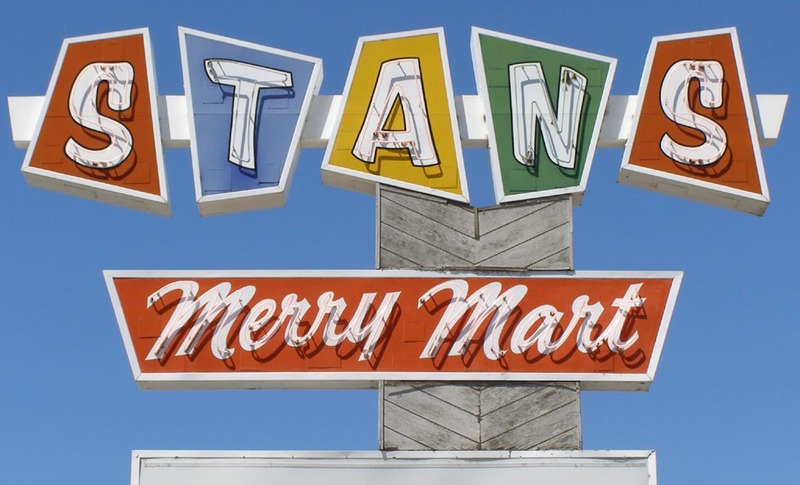 Stan’s is a discount retail store like Wal-Mart or Target except for the time warp aspect and the fact that there’s only one and not millions of locations. Their motto is, “If we don’t have it, you don’t need it!” I had to buy miscellaneous bits and pieces for my new home and decided to give it a try. The mid-century retro signage has been intriguing me for days. It seemed like a perfect opportunity to check Stan’s out. Upon walking into the store I had no less than three people greet me and ask if I needed help. I was on a mission to find large sheets of plastic so I let one of them know my quest, she showed me directly where it was located. After checking out the plastic and gathering the random items I needed, I knew I could not just bolt out of the door. I had to explore. I figure if ‘They don’t have it, I don’t need it’ also meant there must be things I needed that I may not know about. 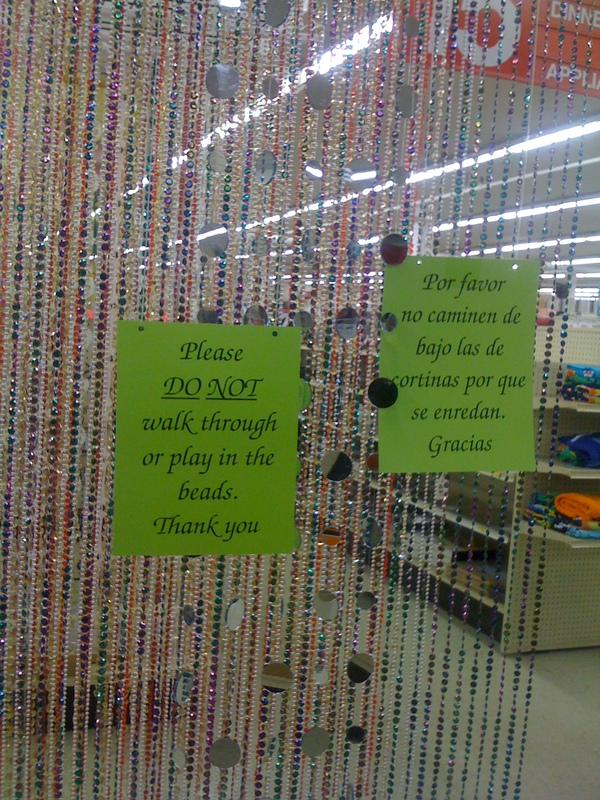 Like plastic beaded curtains. I resisted the urge to drape the beads around myself, but it required the discipline of a monk. …these shoes. Somehow I think over time they migrated into the wrong box. I have a difficult time believing these are steel toe. There were piles and piles of old shoes like this. 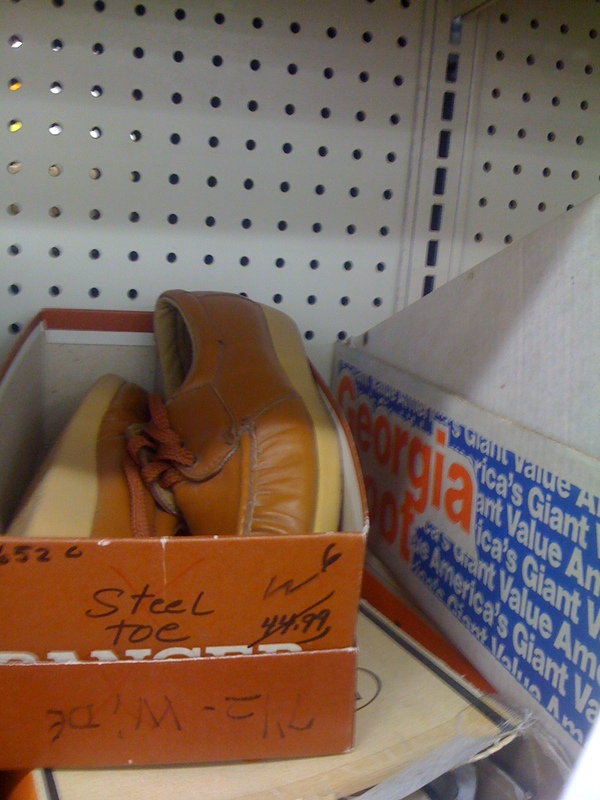 Next time I drive the DeLorean into the store I am going to explore more deeply the ancient shoe variety. One thing about Stan’s Merry Mart is that organization comes second to providing great products. In more than a few places I found piles of things that appeared to be back stock that were mish mashed together on the saleroom floor. 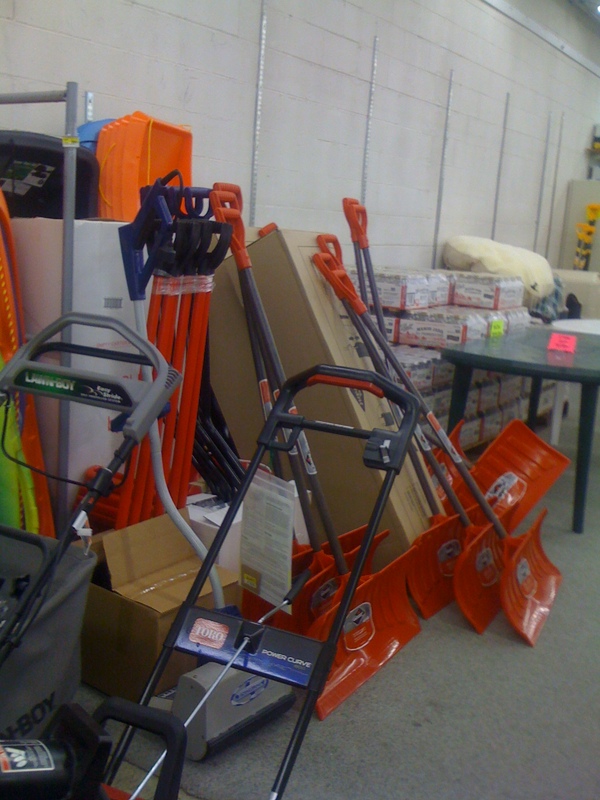 Here we have a variety of winter items. My guess is you are to close your eyes and buy the first thing you grab. Try not to reach too deep, you’ll knock over everything. Just take whatever is on the top. One great thing about where this shop is located: There are oodles of stores with fantastic signage from the mid 20th century like Stan’s. The areas of the town that are not plagued with Applebees and Old Navys, boast west coast style of architecture which keeps me feeling like I am still exploring a new culture. I don’t quite feel at home, but like I am taking a vacation for a really long time. The feeling will pass. It”ll be good, I want to feel at home. ‘Til then, I’m loving the holiday! Oh, what if they have the wedge shoes from the old Teen Magazine???????? You have to look for me!!!!!! Yes, that is a must! What a great store! I bet you will be in there alot. Would rather shope there than Wal Mart anyday. Keep your business local and shop there often. Strikes me as the type of place that if they do not have what you are looking for, they will be happy to order it for you. You are so lucky. I remember exploring Stan’s when I was five. Did I mention I was born in that town? I’d guess that easily half the population is related to me by blood or marriage (well, perhaps the population that lived there in 1976…it’s grown a lot since then). I’d guess those shoes were there when I last wandered the aisles (such as they are) which would have been some time in the late 80’s. OH…OH OH OH!!! If you’re at Stan’s, you’re just a few yards from Checkers Drive-In which is AWESOME in ways that only a west-coast burger shack can be! Seriously, if you go retro, go all the way and get food from Checkers…seriously good! I will have to try Checkers, for sure. Amazing that that’s where you’re from…small world. Checkers have some awesome burgers. There’s one in Staten Island and I try to have lunch there when I’m ever in the area. And what’s with people and their Wal-Mart hate? Wal-Mart rocks! I wish there was one in my area. That store does look epic though.